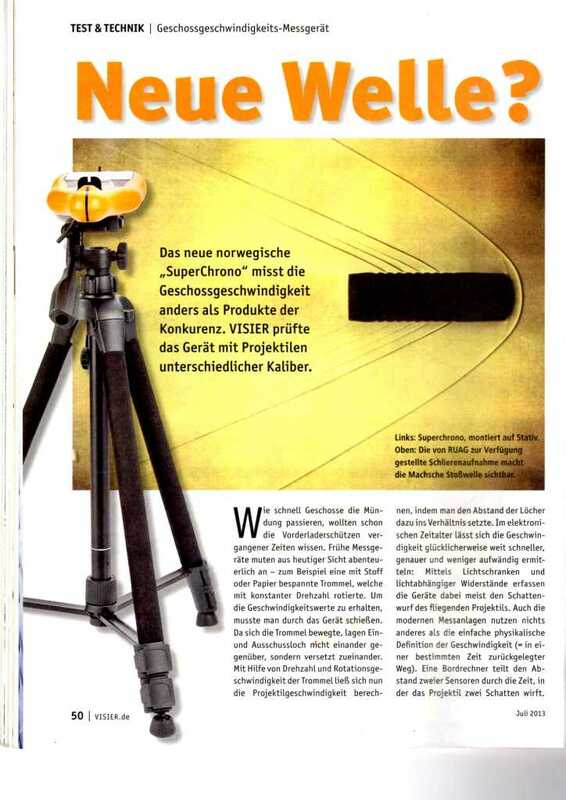 The German firearms magazine Visier dedicated six pages to a review of the SuperChrono in its July 2013 issue. The SuperChrono was held up against a pair of Mehl BMC18 reference chronographs for different calibers and loads. The SuperChrono was placed 3m from the muzzle followed by the BMC18s spaced 10cm (4″) apart. 5-shot series were used throughout. 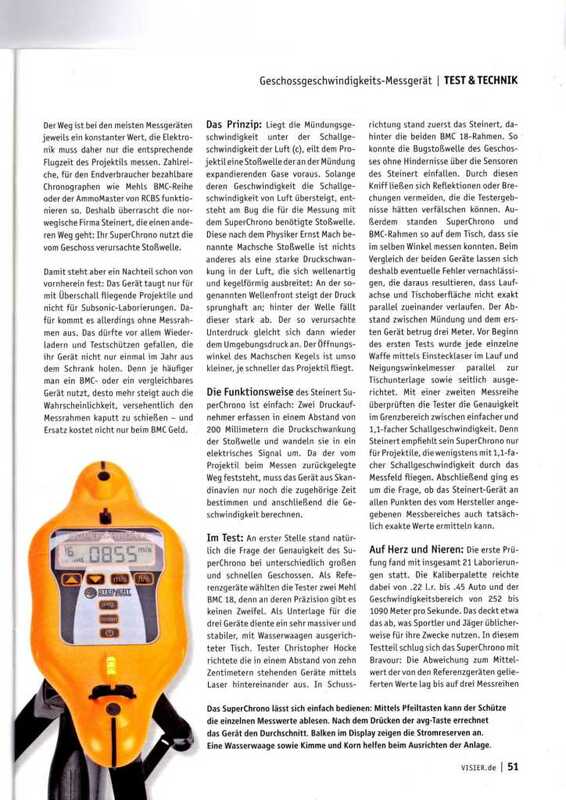 The average reading of the SuperChrono was compared to the average figures from the two BMC 18s. 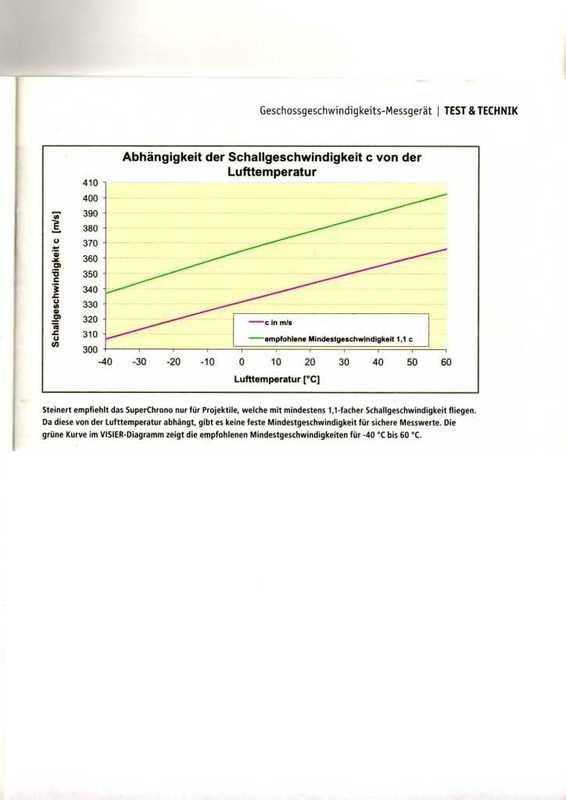 For .308 loads the deviation was 1-1,5 m/s or just .11 to .18% from the velocity readings from the pair of BMC 18s. These are very satisfactory numbers and they prove once and for all the relability of the SuperChrono. For .223 loads deviation was .83 to 2.94%. This is higher than expected. This may be due to the short measuring distance of 3m. For high speed loads we recommend placing the SuperChrono 5m in front of the muzzle. Optical systems may also be less suited for short and fast bullets such as a 35 grs .223 at 1057 m/s. There’s actually a post out on the web testing this exact same load in a 16″ barrel with a Magnetospeed and getting 1059 m/s, just 2 m/s from the SuperChrono figure.. 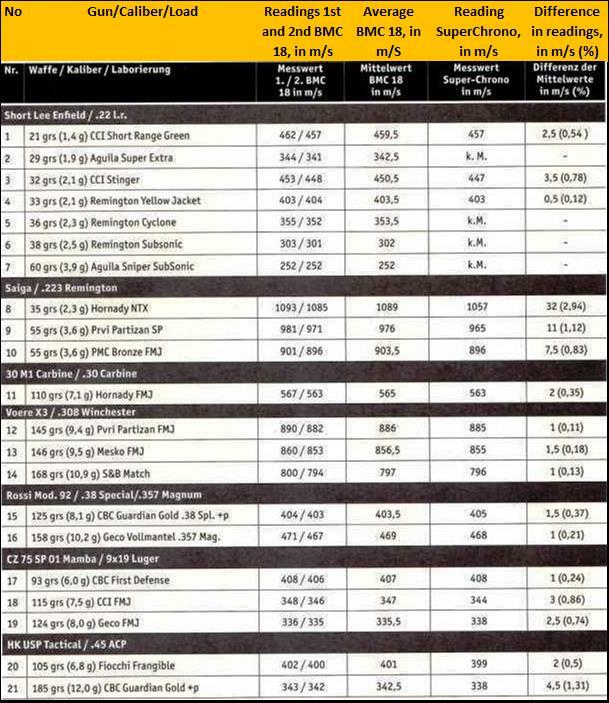 It is also worth noting that the BMC 18 has a stated accuracy of within 1% of actual bullet velocity. The difference between the two BMC 18s was in some cases larger than the difference between the SuperChrono and their mean velocity. 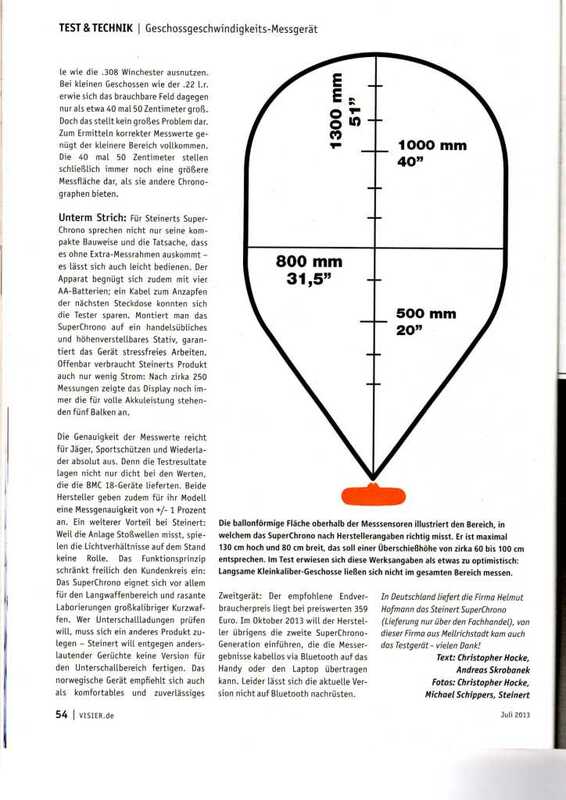 The distance between the midpoints of the two BMC 18 was around 25 cm. This is not enough to explain the velocity differences between the two BMC18s, which is about .9% on the average. As an example, for the .308 load in row 12 the difference between the two was 8 m/s. Average was 886 m/s while the SuperChrono measured the bullet to 885 m/s. All in all this is a very thorough and conclusive test. 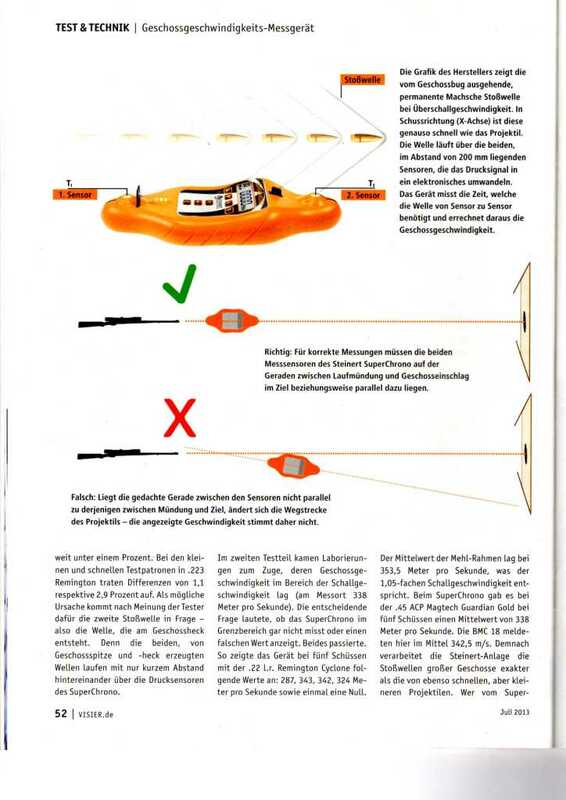 It proves without doubt that the acoustic detection principle gives the highest possible accuracy. The review goes on to conclude that operating the SuperChrono is hassle free, battery life is long and that it’s attractively priced. 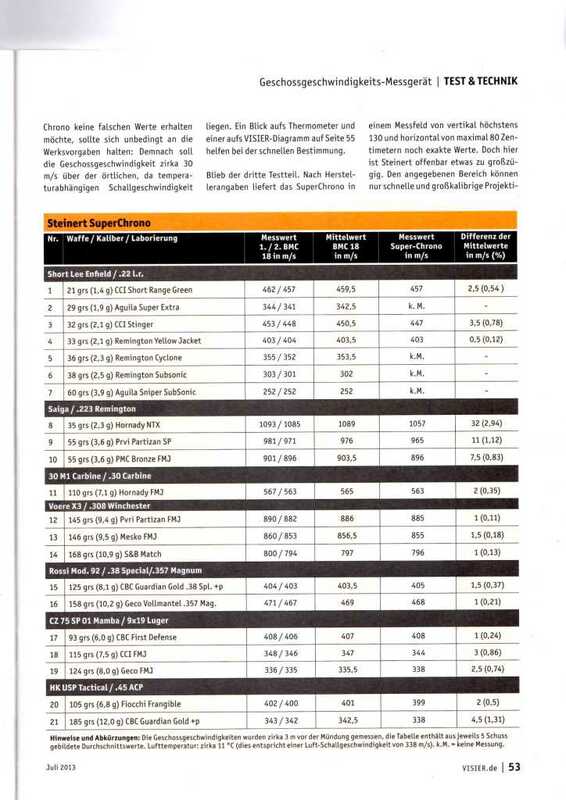 For the benefit of non-German speakers, here follows a version of the main comparison table with English column headers.